Cheddar technique meets roquefort culture in this quest for the very best and most balanced hybrid of two classic styles and flavors. Mellower than most blues and with more personality than most cheddars, these Wisconsin originals are impossible to classify. These incredible cheeses are proof of Wisconsin cheesemakers’ commitment to blazing new paths. More cheddar blue, please, and more blue cheddar while you’re at it! Full-bodied cheddar flavor with brilliant blue notes. Nutty, earthy and creamy. 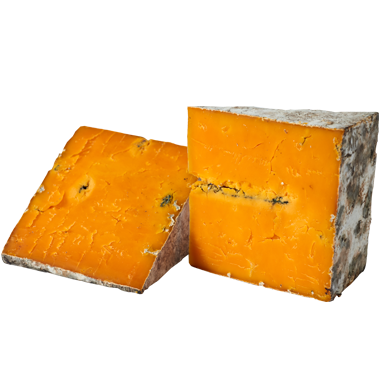 Most things you can do with cheddar or blue you can do with this punchier version of the former and mellower version of the latter. It’s best at room temperature or melted in our humble opinion. Don’t mind if we do, and as often as we can! We like to pair these potent hybrids with bigger beverages. Ciders and fruit beers are good bets, as is a solid porter. Cabernet sauvignon and chianti both have the strength to stand up and complement cheddar blue, as do port and madeira. There isn’t much that these versatile cheddar blues can’t do. We particularly enjoy them sandwiched in-between a classic blue and farmstead cheddar on a cheese board. We’re also pretty fond of it melted on top of, or crumbled inside, a hefty grilled burger.